I always try to see the Taylor Wessing Portrait Prize exhibition, and its predecessor the Kobal prize before that. Usually I see it at at the National Portrait Gallery but sometimes at one of its touring stops. Touring shows like this really helps shift the arts away from being London centred. Did I mean this portait to be of Helen or the giant bear? While the quality and originality is always a strong feature of this prize something else stood out this year. It was the number of exhibitors who were either published or had exhibited their work elsewhere. Amongst all the photographers published in national and international print publications were several whose work I had seen in print. Sometimes where the portrait exhibited was part of a larger body of work. The number of contestants who had previous solo or group exhibitions was very high too. Discussing it afterwards with a friend who went with me we could not remember this being the case in previous years. Certainly the rules don’t require entries only from published or exhibited photographers. Perhaps it’s simply the nature of competition that contestants who know what editors and galleries are looking for will succeed? Don’t let that sombre thought put you off seeing the exhibition. And perhaps entering next year? Flash, Bang, Wallop, what a cafe! I used to work near Charing Cross on a regular basis and the Portrait Café at the NPG was an oasis! I always find the staff friendly, the food fresh and coffee well made. Some people think the lady in charge looks stern but I have found she does smile and has a sense of humour. 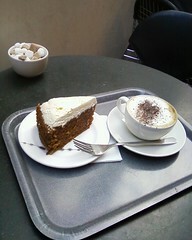 I recommend their cakes when you need reviving in central London. Coming in from the St Martins entrance you pass the temporary photo exhibition which at least is interesting if not really good. Then a stroll through the bookshop and I find focusing on refreshments stops me from browsing and buying books. One of the pleasures of this cafe is sitting at a table under the glass ceiling when it rains. Seeing and hearing the rain falling from a comfortable cafe is always a treat.